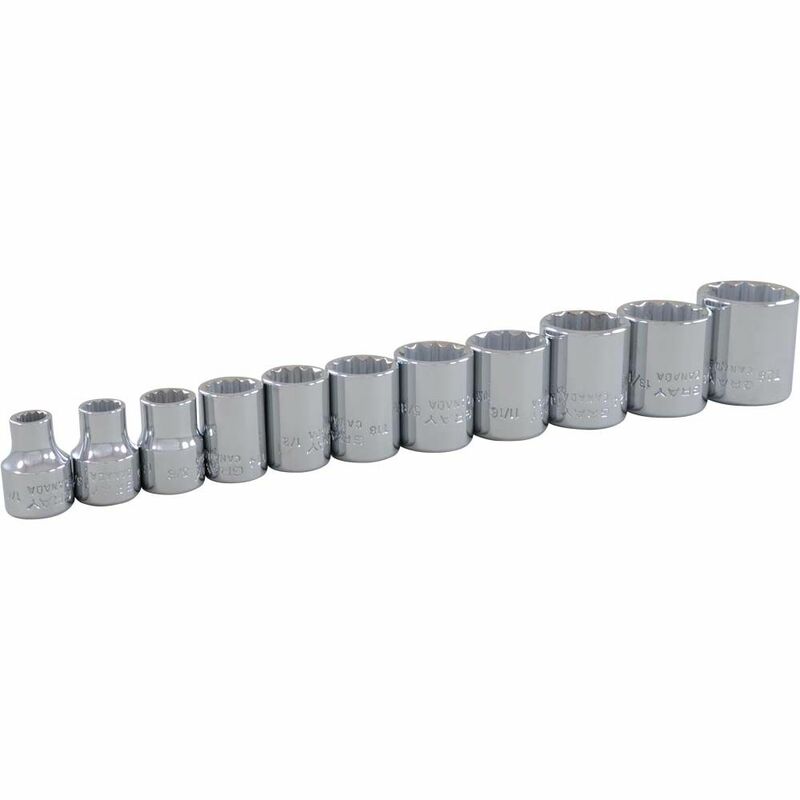 The sockets in this 11 piece 3/8" drive 12 point SAE standard chrome socket set feature outstanding corrosion resistance as a result of our proprietary in-house plating process. In addition, Gray sockets are made from premium tool steel for maximum durability and feature a distinct brilliant jewellery-like finish. Made in Canada and backed by Gray Tools worry-free lifetime warranty. Contains Sizes: 1/4", 5/16", 3/8", 7/16", 1/2", 9/16", 5/8", 11/16", 3/4", 13/16", 7/8". Mirror chrome finish for maximum resistance against corrosion. Made from premium tool steel for maximum durability. Designed for use on 6 and 12-point fasteners. Gray Tools warrants this product to the original purchaser for its useful life against defects in material and workmanship. This limited life warranty does not cover misuse, abuse, modification or unauthorized repair. Please call 1-800-567-0518 for more information. The sockets and attachments in this 15 piece 3/8" drive 6 point metric standard and deep chrome socket set feature outstanding corrosion resistance as a result of our proprietary in-house plating process. In addition, Gray sockets are made from premium tool steel for maximum durability and feature a distinct brilliant jewellery-like finish. Made in Canada and backed by Gray Tools worry-free lifetime warranty. The sockets in this 10 piece 1/4" drive 12 point SAE deep chrome socket set feature outstanding corrosion resistance as a result of our proprietary in-house plating process. In addition, Gray sockets are made from premium tool steel for maximum durability and feature a distinct brilliant jewellery-like finish. Made in Canada and backed by Gray Tools worry-free lifetime warranty. The sockets in this 18 piece 1/2" drive 12 point metric deep chrome socket set feature outstanding corrosion resistance as a result of our proprietary in-house plating process. In addition, Gray sockets are made from premium tool steel for maximum durability and feature a distinct brilliant jewellery-like finish. Made in Canada and backed by Gray Tools worry-free lifetime warranty. The sockets in this 9 piece 3/8" drive 12 point SAE deep chrome socket set feature outstanding corrosion resistance as a result of our proprietary in-house plating process. In addition, Gray sockets are made from premium tool steel for maximum durability and feature a distinct brilliant jewellery-like finish. Made in Canada and backed by Gray Tools worry-free lifetime warranty. 11 Piece 3/8 Inch Drive 12 Point SAE, Standard Chrome Socket Set, 1/4 Inch - 7/8 The sockets in this 11 piece 3/8" drive 12 point SAE standard chrome socket set feature outstanding corrosion resistance as a result of our proprietary in-house plating process. In addition, Gray sockets are made from premium tool steel for maximum durability and feature a distinct brilliant jewellery-like finish. Made in Canada and backed by Gray Tools worry-free lifetime warranty.